Artist Ann Tremarello, Fairbanks, Alaska. There are many roads in the life journey. 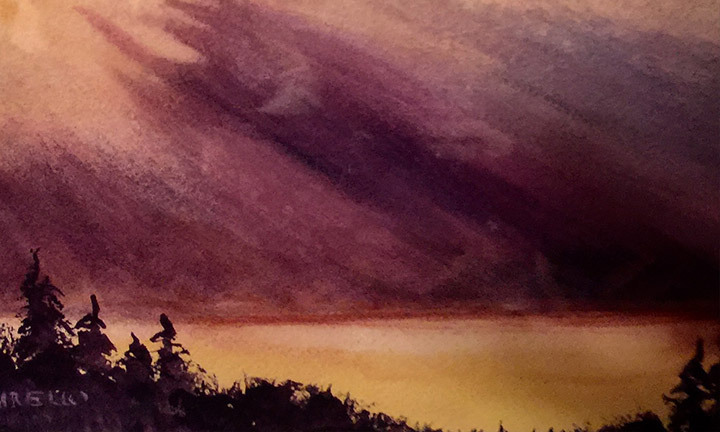 This painting by dear friend, Ann T, has special meaning to me. Each year Lathrop High School honors the late Joe Tremarello with the Joe T Basketball Classic in Fairbanks. Joe was my mentor when I coached at the University of Alaska 50 years ago, he was the highly successful coach at Lathrop. Ann had highly important positions at the university for 43 years. She has become an accomplished artist. As an expression of appreciation for traveling to Fairbanks to honor Coach T at the classic, Ann gave me the choice of one of her many paintings. This was difficult. I reduced it down to two paintings. I liked both. Finally, I chose the one you see in this story. This was a perfect complement to Daily Words of Hope with Fred Crowell. My hope is to bring words of hope for all who are in their life journey. If someway, somehow each of us can get on our road of hope. Recognize and admit being on the wrong road. Stop, look and listen. Get off the road. Get help from people who have the skills to teach you how to travel on the road to hope.